The new Information Initiative at Duke (iiD) brings together a supergroup of experts to translate massive data into major breakthroughs—in arenas from homeland security to human health. We're at a moment in which we seem to have become better at collecting data than understanding it. Sensors, cameras, computers and smart phones capture and store an unending torrent of data about human activity via ubiquitous wireless signals, making nearly everything measurable and identifiable. Billions of fingers perform trillions of keystrokes and clicks, all of them leaving traces somewhere. Every two days now, wired humanity creates 5 exabytes of new data(1018 bytes). That’s about how much was recorded from the dawn of civilization until 2003. YouTube’s collection of video grows by 72 hours each minute of the day, double the growth rate from the previous year. Thousands of people have had their 3-billion-bit genomes sequenced,and millions more will follow. Google chairman Eric Schmidt has said we’re fast approaching an age in which “everything is available, knowable, and recorded by everyone all the time.” But for now, it’s a tower of Babel. There are surely some profound and useful insights buried in this mismatched mountain of information that could improve public services,homeland security, environmental stewardship and global health if we could only see the patterns. But parsing through a boundless sea of incompatible, wildly diverse data sets will take some extraordinary effort. “We are going to bring the engineering discipline of control into things you never thought it could be applied to,” said Robert Calderbank, the Phillip Griffiths professor of computer science, mathematics and electrical and computer engineering at Duke University. With support from Pratt School of Engineering Dean Thomas Katsouleas, Provost Peter Lange and many other campus leaders, Calderbank is leading the launch of the Information Initiative at Duke (iiD). The effort is bringing together nearly a hundred faculty and student researchers from diverse fields and backgrounds into a shared space on the third floor of Duke’s newly remodeled Gross Hall. They will join forces to turn “Big Data” into big insights, and start creating the next generation of thinkers who can carry the data revolution forward. The initiative draws on Duke’s expertise in Bayesian statistics, image processing, genomics, remote sensing, wireless devices, social science, healthcare, signal processing, finance, machine learning,computer science and a host of other fields. "There are a group of people here—math, stats, engineering-type people—who work together already on a wide variety of projects related to big data,” said Lawrence Carin, the William H.Younger distinguished professor and chair of electrical and computer engineering (ECE), who helped to launch the new initiative. The group has already won major grant competitions such as a $3 million Mathematics of Sensing, Exploitation and Execution program through DARPA, and is also involved in large research programs for the Department of Homeland Security. “It’s not something where we said ‘We wish we had a center, let’s make one.’ This initiative formalizes something that already exists,” Carin said. Once assembled, the experts at the iiD will reach out to people from across campus who have big data problems. One of those researchers is neuroscientist Ahmad Hariri, who has fMRI brain scans, genetics and questionnaire data on hundreds of volunteer study subjects. It’s a massive and complicated collection that requires equally complicated analyses to reveal important clues about varying responses to life’s challenges that can distinguish risk and resiliency to mental illness. Working with Carin, statistics professor David Dunson and others, the big data team is jointly studying the MRI scans, questionnaire data and associated genetic data as a package to identify specific patterns connecting genes, brain and behavior to mental illness. ECE, computer sciences and biomedical engineering professor Guillermo Sapiro is working with child psychiatrist Helen Egger, chief of Duke’s division of child and family mental health and developmental neuroscience, to automate the analysis of hundreds of hours of video of children interacting with their parents, school peers, teachers, friends and doctors. Egger has enlisted graduate students to analyze the tapes for various behaviors and telltale signs of anxiety disorders, but it is extraordinarily labor-intensive, requiring several hours to code two hours of tape per patient. For their study to scale up, Egger would like to see how much of the coding could be automated by Sapiro’s algorithms. Like Hariri, she also has questionnaire data, brain scans and genetics that need to be mined for larger patterns. As more kinds and volumes of data are brought into the iiD, social scientists will be involved to help formulate new questions, says Tom Nechyba, director of Duke’s Social Science Research Institute(SSRI). The institute is also moving some of its operations into the second floor of Gross Hall. For example, statisticians and computer scientists are planning to assemble a collection that combines census data by ZIP code with anonymized Medicare and Social Security records, and then the social scientists will help figure out what questions to ask of it. “We have the potential to be the best place in the world where information science meets the social sciences,” Calderbank said. 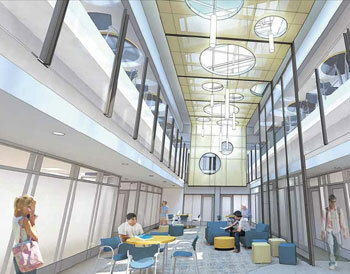 The space in Gross Hall has been designed with what Carin calls ‘flex space’ to enable scholars to move in for a year or so to work intensively with the team on a problem and then return to their home unit with new skills and collaborations.The social scientists, one floor below, are also building a coffee shop into their space to encourage spontaneous and relaxed interactions. But for Calderbank and Carin, the iiD is as much about education as it is about research. “Ask yourself, what sort of people does IBM want to hire?” says Calderbank. The answer, he thinks, are engaged, socially adept students who also have killer analytical skills—the sorts of students Duke is already attracting. “A company with a big data problem wants to be able to talk to somebody who can listen to their challenges and then build something quantifiable.” Duke students engaged with real-world problems of big data will be equipped with the quantitative and communication skills to help them thrive in the data-driven world, he said. “The student experience will start with some new gateway courses dealing with big data in modules to get students excited about the intersections of information, society and culture,” Calderbank said.“We’re going to have them navigate our curriculum in a more intentional, purposeful way,” to assemble the tools they need. David Dunson said the new initiative is also interested in partnerships with outside companies. “These companies and researchers have needs; we have methods. You have a problem, you can come to us and we’ll help you solve it,” he said. Corporate partnerships may also supply some funding to the iiD and could create real-world opportunities for Duke students. “The idea is to make Duke a leader in this field,” through both research and teaching, he said. “If you want to engage with the world, you’re going to engage around data,” Calderbank said.